Visibility/Location: The event is easy to find, as the title of the haunt, �Frightmare,� is in glowing neon lights on top of the haunt building. Also, the haunt is located inside the Haunted Trails amusement center, which had a large marquee sign. Basically, if you pull into the parking lot for Haunted Trails, you will easily see the haunt itself. Parking was directly in front of and behind the haunt, and there was plenty of parking to be had. Parking was also free. Wait Entertainment: There was no wait entertainment to speak of, but there was also no wait, as there was no line at the time we were there. Scare Factor: Low-Medium � Scares were mostly of the �jump out and startle� variety. They were low intensity and really relied on surprise more than anything for effect. Crowd Control: There were very few people there on the night we went, so we did not run into anyone inside of the haunt at all. We were able to walk through unhindered. We can�t say if this works the same way when there is a line, though. Frightmare has been a favorite haunt for a number of years now. It�s nothing fancy � in fact, part of its claim to fame is the fact that it looks like a cheesy carnival attraction from the 1970�s In fact, a portion of the haunt building is actually one of these �funhouse� types of attractions, but it has also been added onto. The pre-fabricated portion of the haunt features various spooky paintings and a couple of turrets which people walk into and out of. The front of the haunt looks like an old wooden porch, with a ticket window in the center and the entrance to the left. In previous years, Frightmare has had a movie theme, and the outside of the haunt has been decorated with movie posters. However, this year, Frightmare�s theme changed to a haunted hotel theme, and all of the movie posters and memorabilia have been taken down. Upon entering, visitors are greeted by a ticket taker sitting in a hotel lobby setting. He reads visitors the rules then they are free to enter the haunt. The first room is a cannibal kitchen, featuring a crazy chef and a room filled with body parts. Following this room, visitors wind their way through a series of small rooms, including an Exorcist type room with a moving figure on a bed, a hall of mirrors (which used to be a Michael Myers/Halloween setup), a room featuring a figure of the Phantom of the Opera seated at a large pipe organ, and a dark section that simulates an underground passage. All of the rooms in Frightmare are also decorated in glowing neon paint. Although the haunt is not advertised as being in 3D, on previous visits we have actually worn 3D glasses and the effects to work. As it is, though, the paint scheme only serves to give Frightmare a unique spin and enhance the whole carnival funhouse vibe that exists. Following the cave like room, visitors find themselves outside, where they have to climb a winding staircase, cross the roof (where a surprise awaits), and climb back down another staircase to enter the second portion of the haunt. It�s during this outside part that visitors can really see the prefabricated portion of the haunt, with its painted metal walls and old props in the windows. One is really reminded of an old 1970�s carnival or state fair, where attractions like Frightmare were a part of the overall experience. The second part of the haunt begins with a surprise on the outside, followed by a girl�s bedroom setup, complete with live actor and a large pile of stuffed animals that is not all that it seems. The penultimate room contains a rather larger animated dog prop (that used to be the Wolf Man portion of the display when it had a movie theme), along with a couple of live actors who followed visitors, telling them that �he� was going to get them. They were quite effective, and kept following throughout the end portion of the haunt. This section used to be both a setup for a scene from the Texas Chainsaw Massacre and Camp Crystal Lake from Friday the 13th, but now was more a combination of the two. It was an outdoor camp like setup with hanging, bloody sheets as seen in Texas Chainsaw Massacre. There is also a surprise in here, but to be honest, it wasn�t as dramatic as it could have been. Overall, the current iteration of Frightmare is not as fun as it used to be. While it was never high on scares (being more creative than frightening), the change of theme has lessened the impact. Also, there seemed to be fewer actors inside than in years past. There were about eight actors total that we can recall. 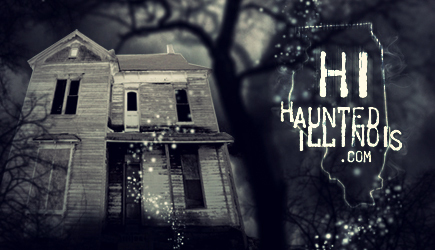 While the cheesy 70�s nature of the haunt is certainly endearing, and may be a lot of fun for those with families, younger children, or for those who are easily scared, there really isn�t a lot to see. However, it�s still enjoyable if one thinks of it as more of a carnival attraction than a haunt.